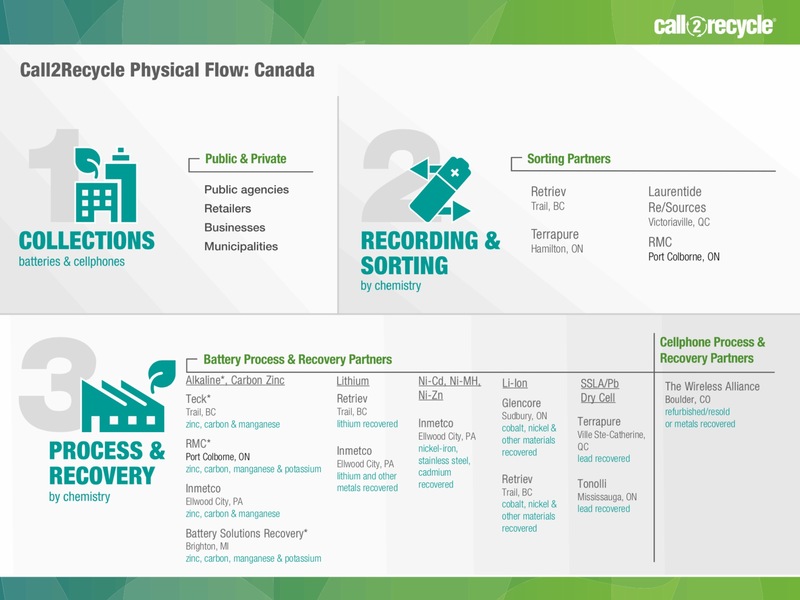 What happens to batteries and cellphones after you drop them off at a Call2Recycle® collection site? They begin a fascinating journey through the recycling process, with the metal and chemical byproducts eventually winding up in new products and the remaining waste safely disposed of according to international recycling standards.Call2Recycle follows three simple steps when recycling batteries and cellphones. You can also watch the process in action in this video. Sorting: Retriev Technologies, Newalta and Laurentide Re-Sources receive the batteries at their warehouses, record details about the weight and battery types of the shipment, then separate the batteries by chemistry. Cellphones are sent to the The Wireless Alliance for recycling. Process and Recovery: The batteries are now ready to be processed. Specific chemistry batteries are shipped to appropriate specialty processors. The processors extract usable chemicals and metals to be used in the manufacture of new products. Cellphones are either refurbished and resold or recycled, with the proceeds used to fund the cellphone collection program and educational outreach. Waste products are responsibly and safely disposed of according to Responsible Recycling (R2) and Basel Action Network (BAN) standards. All recycling occurs in North America, and nothing is disposed of in a landfill. No waste materials from the recycling process are exported out of the country.